On December 2nd, 1942, a team of scientists led by Italian émigré Enrico Fermi set the world's first man-made, self-sustaining nuclear chain reaction in motion at Chicago Pile 1, the world's first artificial nuclear reactor built under the original site of the University of Chicago's Stagg Field. The event was a decisive step toward the creation of the age of atomic energy, and critically, at the time, to the production of the atomic bomb for use in World War II. Exactly twenty-five years later, on December 2nd, 1967, the sculpture Nuclear Energy was unveiled as a memorial to the accomplishments of Fermi and his fellow physicists. Like anything that is powerful, it has a power for good and evil...the lower part [of the sculpture] is more architectural and in my mind has the kind of interior of a cathedral with sort of a hopefulness for mankind. In 1961, the University of Chicago's then-president George W. Beadle set up a committee to oversee the upcoming 25th anniversary of this momentous event. Until that point there had been only a small plaque hanging on a fence to mark the site, so the search committee was instructed to look for an artist who could create a full-scale monument. Professor of History William McNeill, a key figure on the committee, approached several sculptors including Henry Moore to see if they would be interested in the task. Moore accepted the offer, and in December of 1963, Professor McNeill traveled to Moore's studio where he had already started work on a maquette (small scale model) that would later become the basis for Nuclear Energy. Moore created Nuclear Energy in the same way he did many of his other public sculptures at the time. Working almost exclusively in plaster, he initially created a small maquette that would then be scaled up and cast in bronze. 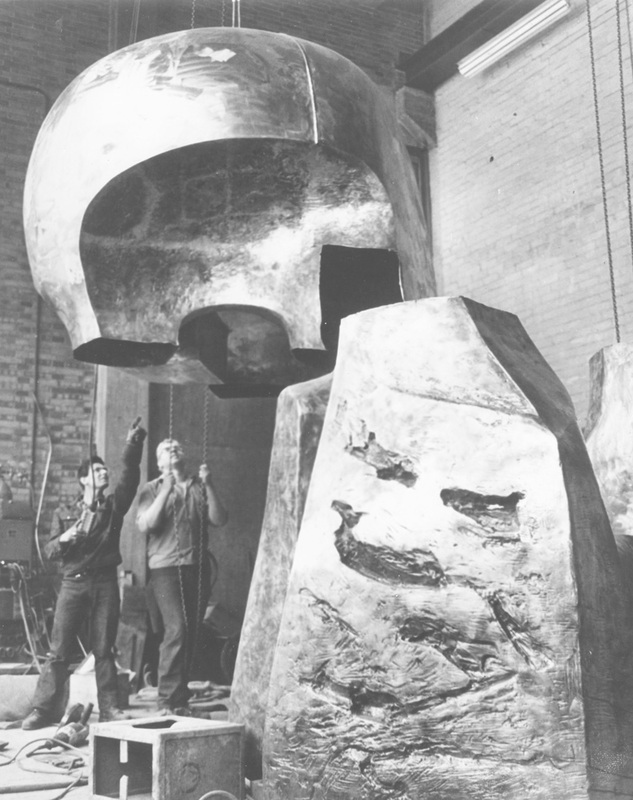 As Nuclear Energy was a particularly complex piece, Moore took the work to be cast in Berlin by the master founder Hermann Noack. The difficult process took around ten months to complete, with the work first cast in 50-60 separate pieces that then had to be welded together. Like an enormous 3-D jigsaw puzzle, the fit of the pieces had to be perfect to create a seamless appearance in the overall shape. After construction, the sculpture was then patinated, a process that involves the application of chemicals to the surface of the bronze to produce a particular color and finish. The final color of the work was important to Moore, though he realized corrosion on the surface could be an issue (due to the natural chemical reaction that turns bronze green in color). On this subject he noted that “We can retain [the patina] to some extent by keeping it clean.” Cleaning and waxing the sculpture is still a vital responsibility for the University today. 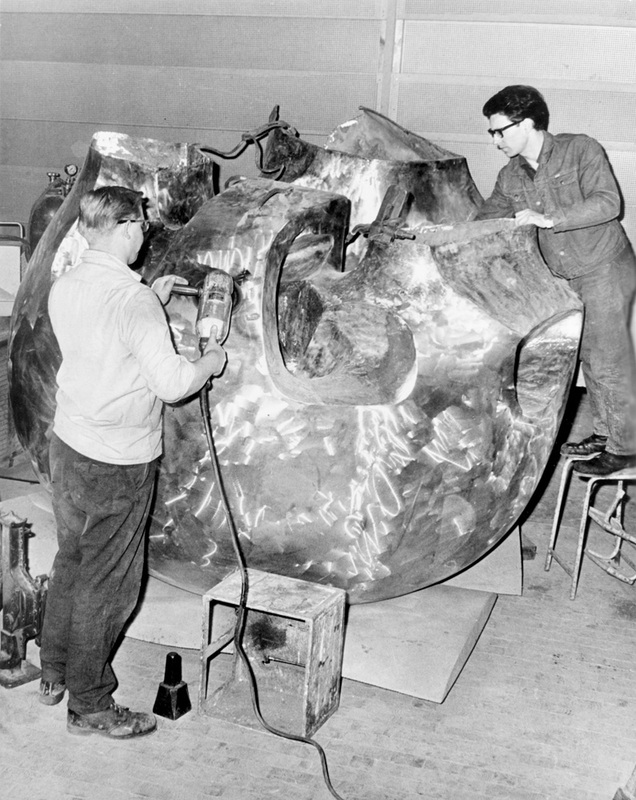 Even before Nuclear Energy had been cast in bronze, an image of the working maquette was circulated at the University. In June 1965, the University committee overseeing the budget for the memorial viewed a photograph of the proposed sculpture for the first time, and the piece met with a certain amount of resistance. According to archived minutes of the meeting, there was no consensus as to the meaning of the monument, since Moore's intentions for the work appeared ambiguous. 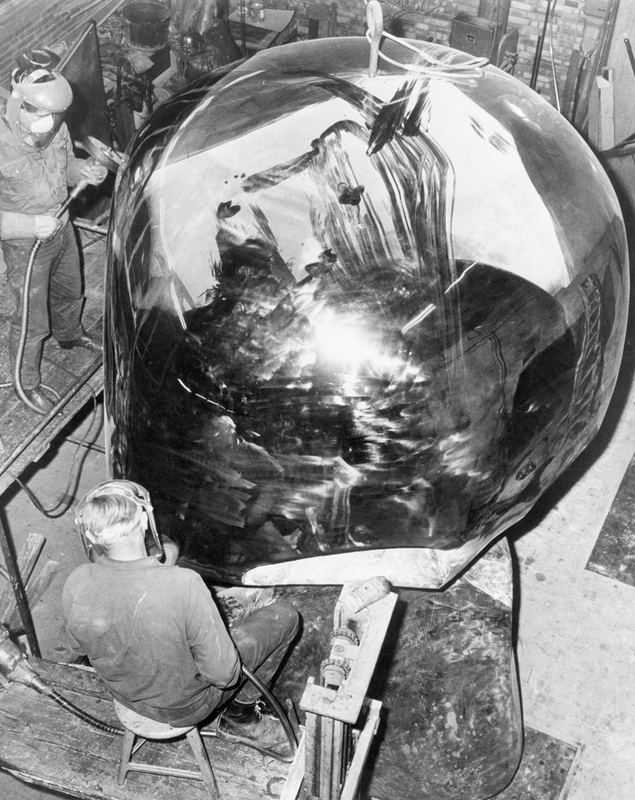 Concerns were raised that, because of the ‘mushroom cloud’ shape of the upper part of the piece, the work could become strongly associated with the atomic bomb rather than Enrico Fermi's scientific achievement at the University. The media were quick to pick up on these tensions—headlines from the time stirred the potential controversy: “Fermi Statue Creates Furor at U. of C.,” read one, and “Is the Memorial Menacing or Just a Mushroom?” asked another. In such articles, Nuclear Energy was seen as potentially threatening and frightening. 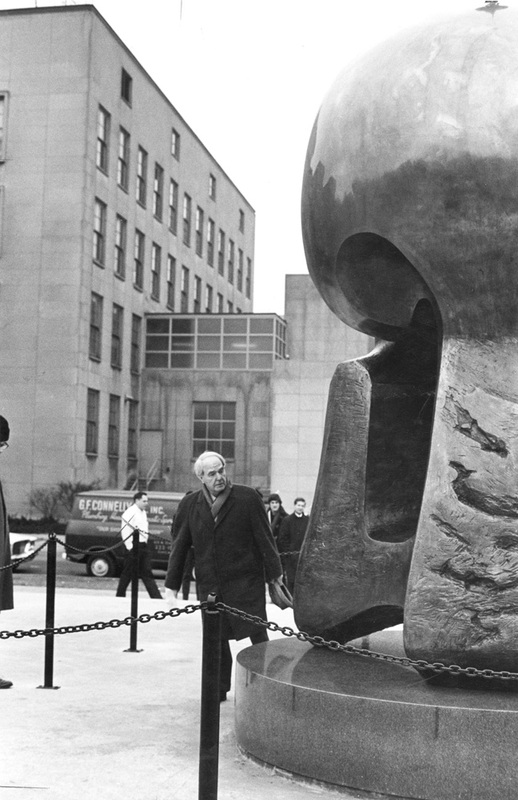 “Henry Moore touches a sensitive area,” wrote one journalist when questioning the sculpture's suitability as a memorial to scientific advancement, and in an era of Cold War politics, the work was seen by some as divisive. As a general principle I prefer to let my work speak for itself, but sometimes it is possible to give a hint of what was in one's mind in making the sculpture. In this, the upper part is very much connected with the mushroom cloud of an atomic explosion, but also, it has the shape and eye sockets of a skull. One might think of the lower part of it being a protective form and constructed for human beings and the top being more like the destructive side of the atom. So between the two it might express to people in a symbolic way the whole event. No single photograph does justice to this monumental sculpture; every change of viewpoint reveals new order and complexity...Certainly the great bronze will mark a point in time and space this is [sic] without doubt, a watershed in the history of mankind. 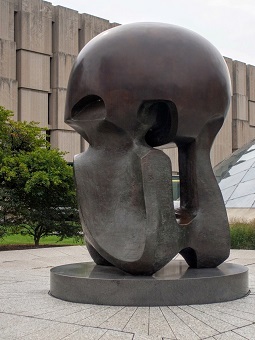 Thanks to the support of University faculty members like Haydon and the B.F. Ferguson Fund at The Art Institute of Chicago, Nuclear Energy was revealed to the public in December 1967 and has had a lasting impact as a powerful testimony to one of the most important scientific developments in the history of the University of Chicago and of the world. Source: University of Chicago Photographic Archive, apf2-05339, Special Collections Research Center, University of Chicago Library. Source: University of Chicago Photographic Archive, apf2-05342, Special Collections Research Center, University of Chicago Library. Source: University of Chicago Photographic Archive, apf1-00916, Special Collections Research Center, University of Chicago Library. Burnell, H. “Sculpture of Atomic Birth Creates Stir at U. of C.”, Chicago Sun Times, September 26, 1965. Haydon, H. “Henry Moore: An Appraisal”, University of Chicago Special Collections, Nuclear Energy Archive. Katzive, D. “Henry Moore's Nuclear Energy: The Genesis of a Monument”, Art Journal, 32.3, (Spring 1973), pp. 284-288. McNeill, William H. Papers, Box 1, Folder 3, Special Collections Research Center, University of Chicago Library. Bach, I. & Gray, M. “A Guide to Chicago's Public Sculptures”, 1983, University of Chicago Press. Hedgecoe, J. “A Monumental Vision: The Sculpture of Henry Moore”, 1998, Stewart Tabori & Chang.